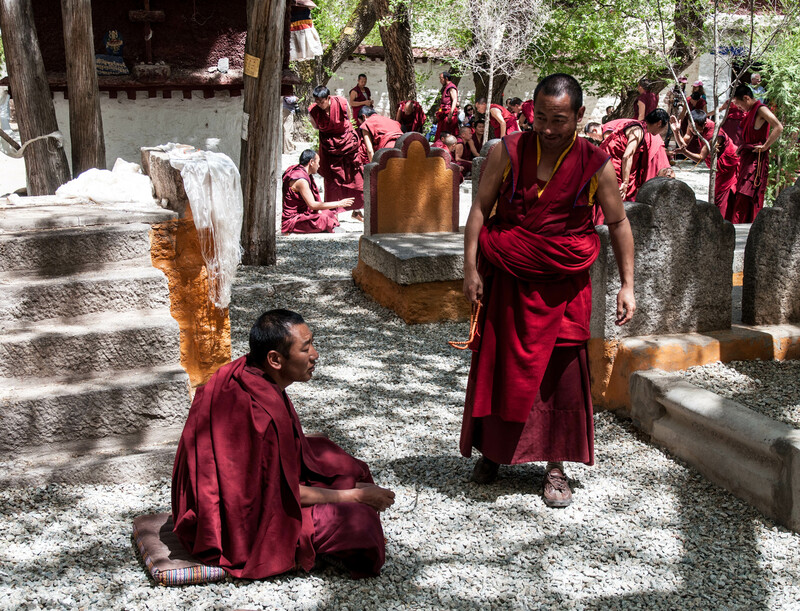 The Sera Monastery is one of the three most important monasteries in Lhasa, the Holy City of Tibetan Buddhism. The others are the Drepung and Ganden Monasteries. They are dedicated to the Gelugpa or Yellow Hat Sect of Tibetan Buddhism and are, or at least were, university monasteries. In earlier times life in Tibet revolved around the monastery. The monasteries played the role of religious center, education center with schools and universities, hospitals, marketplaces, and so on. Even now, much of a young person’s education can still be had at a monastery. 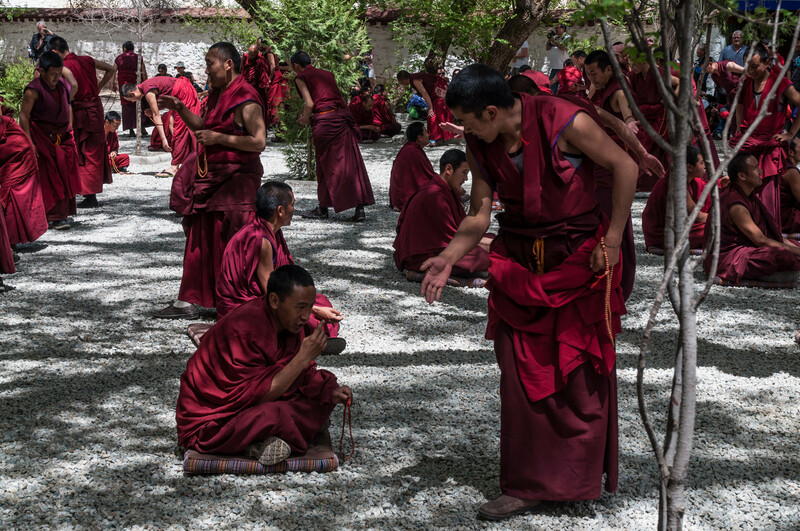 The Sera Monastery was built in 1419 on a hillside in the north part of Lhasa. One of the unique things about Sera is it’s long tradition of debating. As part of the their training, monks participate in a series of debates. These debates are held in a courtyard of crushed stone. Senior monks grill junior monks on various doctrine. The junior monks are seated, while the monks questioning their knowledge of Buddhist scripture fire questions at them, accompanied by dramatic hand slapping. The hand slapping is a signal for the seated monk to respond. The debates are held each day. 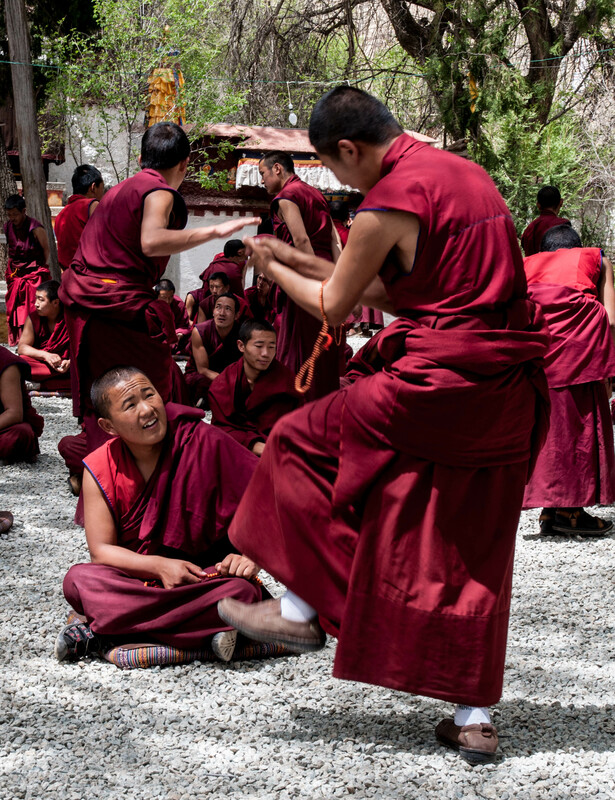 Though it seems pretty entertaining to the visitor, it is serious business and an important part of the training of these monks. 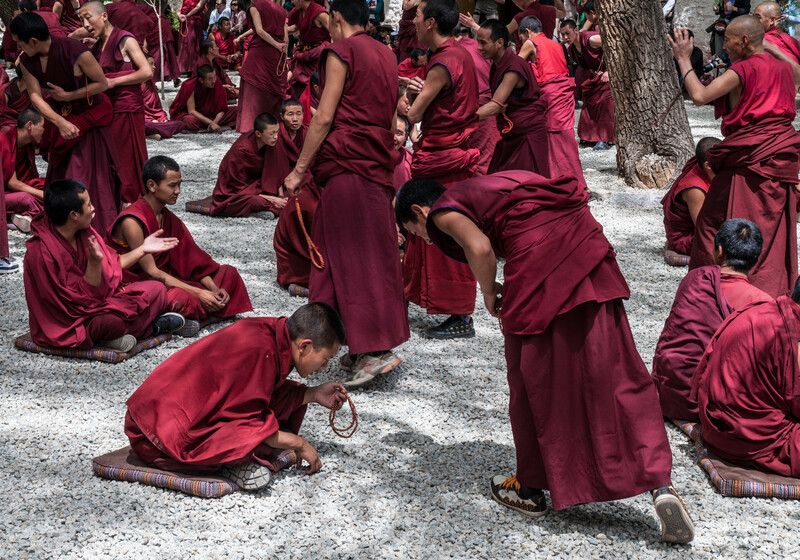 Tibetan Buddhist monks are never without their prayer beads. In fact, most lay people in Tibet also carry prayer beads. The debates last one to one and a half hours. It was noisy and the air was charged with energy. The short video below best shows how these debates are conducted. I found this religious training fascinating. I have always loved Buddhist temples and monasteries for the peace and tranquility that I feel there. This was a little different because it was so noisy and lively. Last year when I was in Tibet, we spent several hours wandering around in the Tashi Lhunpo Monastery in Shigatse. It was a bright sunny day. The sun is very intense on the Tibetan Plateau, which averages about 15,000′. I ducked out of the sun into a hallway that connected a couple buildings and encountered this young monk. The floors were made of crushed stone and were polished smooth and glossy. This monk was polishing the floor. His “mop” consisted of a large bag of rocks with a rope tied around the top. Under the bag was a sheepskin. He walked slowly up and down the hallway dragging the very heavy load. Click on the photo to better see the expression on his face. His skin glistens with sweat and the exhaustion is apparent in his face. To the right, outside the frame, another older monk was supervising his work. 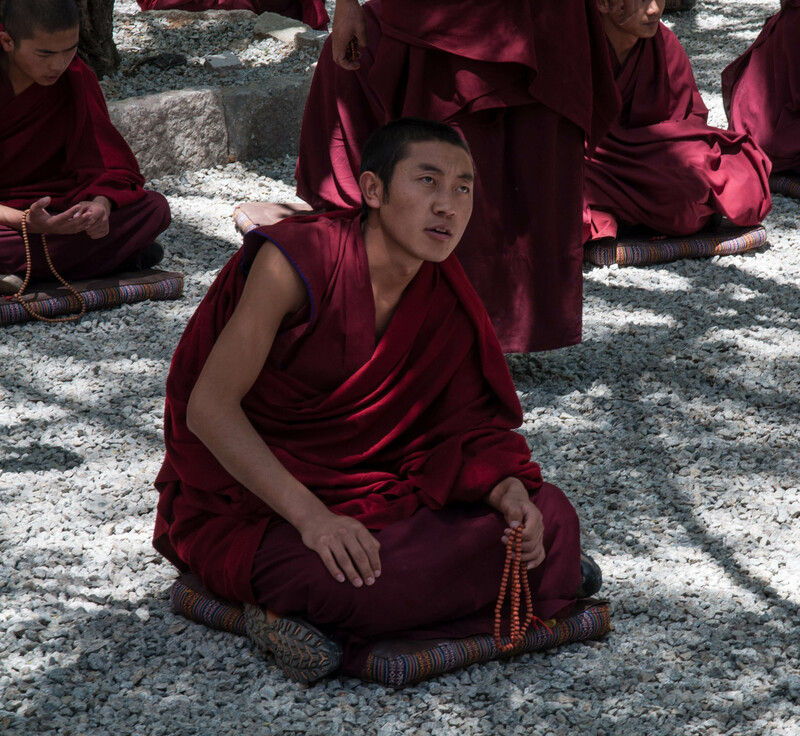 It is not uncommon for junior monks to do a lot of the grunt work in the monasteries. Years ago I was visiting with a Buddhist monk in a monastery in Hangzhou, in Eastern China, and he told me that when he first arrived at the monastery he spent a great deal of time sweeping courtyards and doing dishes. He slowing worked his way up to less menial jobs. In a sense they must pay their dues, or prove their worth. 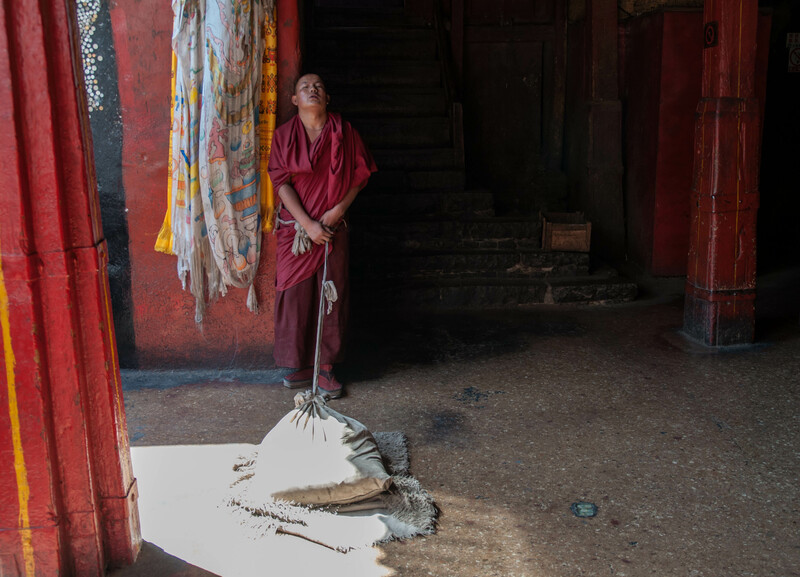 In another Tibetan Buddhist monastery I visited with a monk who was in charge of selling trinkets to tourists. He said it was not his first choice of jobs, but that he was willing to do anything to help out the monastery. I have never heard a monk complain about anything. Even though the harsh sunlight coming in from the left blew out the detail on the bag and floor, I do like this photo. I’m glad I stumbled on this interesting scene. I wish I would have shot more and had taken some closer, more intimate shots of him. But, at monasteries you have to be careful not to be too invasive and respect the privacy of the monks. It was shot with a Nikon D90 with a Sigma 17-70mm lens, at 24mm, 1/80 sec. f/4.5.